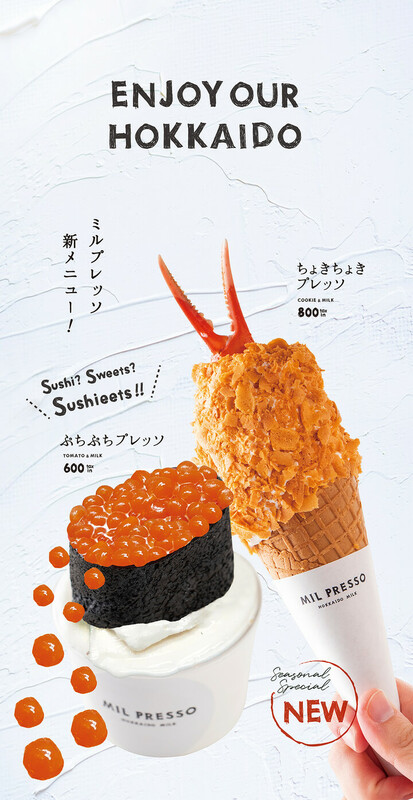 Popular ice cream shop MIL PRESSO selling ice cream that looks like sushi this winter in Hokkaido and Sapporo! 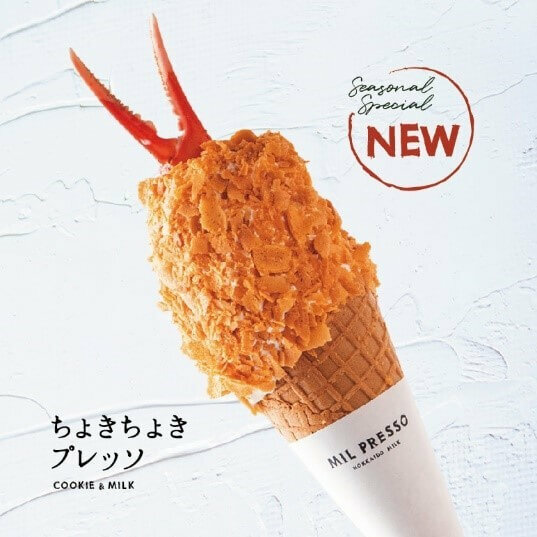 Soft serve ice cream specialist shop MIL PRESSO is now selling two new soft serve ice creams – the “puchi puchi presso” sushi-shaped ice cream and “choki choki presso” croquette-shaped ice cream! MIL PRESSO has opened up shop at Mitsui Outlet Park Sapporo, North Hiroshima and Hokkaido Loco Farm Village, Hokkaido. Sushi? Sweets? Sushieets! The puchi puchi presso precisely portrays a roll sushi topped with salmon roe. The round balls of “salmon roe” are actually made from balls of tomato jelly. 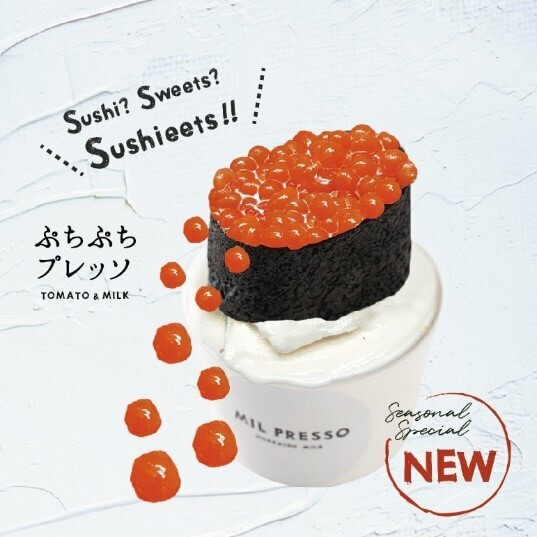 Aiming to produce only fully authentic Hokkaido soft serve ice cream, MIL PRESSO uses only naturally sourced ingredients from Hokkaido; including the milk and tomatoes that are essential to make the puchi puchi presso. A black strip of crepe is wrapped around the ice cream to take on the appearance of seaweed. Once you sink your teeth into this, the bubbly jelly bursts open with the mildly sour taste of tomato, which is soon balanced by the sweet soft serve ice cream. It’s so delicious and MIL PRESSO only sells a limited number of these every day! A croquette- shaped sweet treat – everyone’s favourite! This ice cream looks like a crab-flavoured croquette. The inside contains a mixture of soft cream and snow crab so you can enjoy these flavours together! A coating of pie crust around the ice cream gives it a crunchy texture. Finally, the ice cream is finished off with a crab flake. This combination of sweet and salty is a brand new flavour and is surprisingly addictive! The fluffy and sweet-smelling milk-based crab flake is packed with crab flavour. 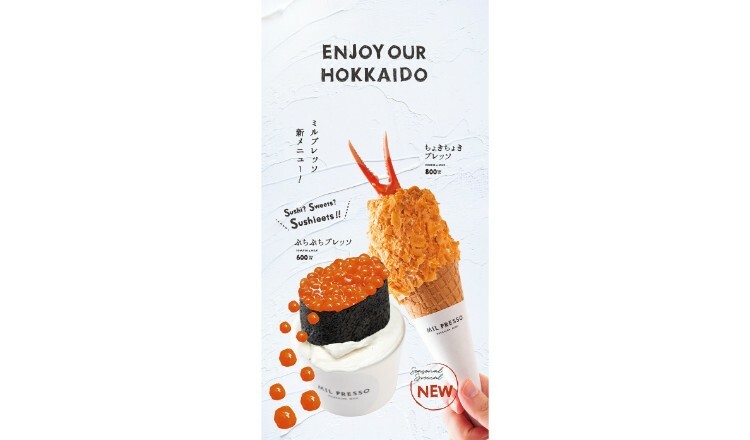 This is the first time anyone has ever seen a crab-flavoured ice cream and it is now a Hokkaido delicacy! Only a certain number of these will be sold per day. Please come try these Hokkaido sweet treats that are full of impact, flavour and originality!